If you enjoy day trips Oaxaca has many. One of the classics takes in the archaeological site Mitla, the rug weaving town Teotitlan, a giant Montezuma cypress tree in Santa María el Tule, and the market in Tlacolula. Beyond Mitla there is a mineral spring Hierve el Agua. Depending on how much you want to take in and how many you are, there are numerous options to get to these places. El Tule or Tlacolula can be reached by bus or colectivo. Teotitlan the same but with fewer busses running. The bus to Mitla might leave you short of your goal so you’ll get to try a moto taxi. If you want to take in several sites in one day then rent a car or better yet hire a guide to take you around. There’s no better choice than Pablo Gonzalez Marsch. Enough logistics, let’s talk Mitla. The archeological site is within the modern municipality of San Pablo Villa de Mitla. Mitla was a religious center. The name Mitla is derived from the Nahuatl name Mictlán for the place of the dead or underworld. The name was Hispanicized to Mitla. What makes Mitla unique is the intricate mosaic fretwork and geometric designs that cover tombs, panels, friezes and entire walls. These mosaics are made with finely cut stone pieces which have been fitted together without the use of mortar. No other site in Mexico has this. 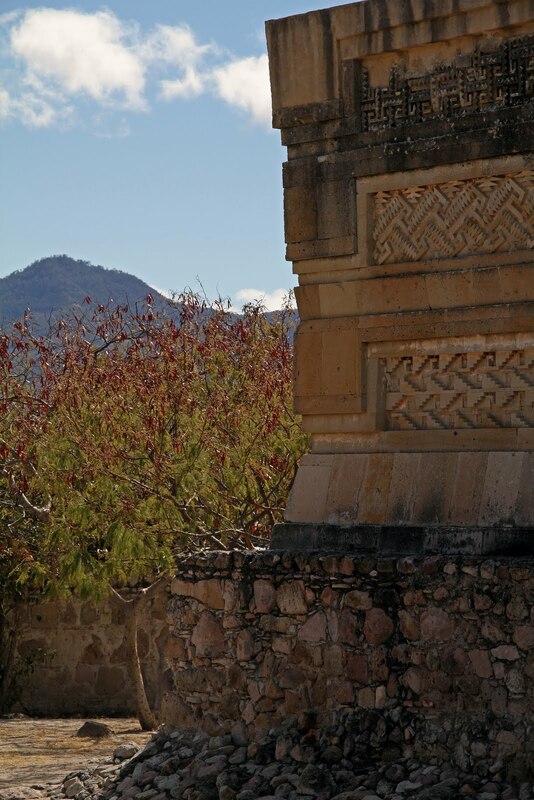 The title photo of this blog was taken at Mitla and is a good example of the work. The Oaxaca valley was settled by the Zapotecs, who developed a hierarchical society governed by nobles. By the time of the Spanish conquest, the Zapotec state has a population of over 500,000, sophisticated construction techniques, a writing system, two calendar systems and agriculture that included the growing of maize, beans, squash, chili peppers, and used irrigation to grow food for a mostly urban population. Mitla was inhabited since the Classic Period (100-650 AD) and perhaps as early as 900 BC. It began as a fortified village on the outer edge of the valley and then became the main religious center for the area. The Mixtecs took control of the area around 1000 AD although the area remained populated by the Zapotec. The city reached its height and largest size between 750 and 1521 AD when the Spanish arrived and was still functioning as a religious center. At that time it had both Zapotec and Mixtec influences in its architecture. Mitla represents Mesoamerican attitudes towards death, as the most consequential part of life after birth. It was built as a gateway between the world of the living and the world of the dead. The high priest resided at Mitla, and the Spanish likened him to the pope. Nobles buried at Mitla were destined to become “cloud people” who would intercede on behalf of the population below. As the site held great political and religious significance, Oaxacan Archbishop Albuquerque ordered the destruction, and dismantling of Mitla in 1553. The remains were used as building materials for the Church of San Pablo, which sits on top of part of the ruins. The site represents the most developed architecture of the Zapotecs and is the product of the syncretism of Mixtec and Zapotec design features which reached it height in 1200. This syncretism can also been seen in the San Pedro Church built in the 16th century on top of a large pre-Hispanic platform which serves as the church atrium. It was believed that in this part lived the lord and lady of the underworld, so the church was built here to keep the “devil” from escaping. Also to collect the booty that natives continued to bring to the site as religious offerings. The group also contains the main temple which faces a large courtyard. The walls are covered by intricate mosaic fretwork and murals depicting mythological scenes and characters. There are tombs under some of the buildings. To the south of the church are other structures whose main building is referred to as the palace. As this part was not considered as the central religious site the Catholic Church allowed it to stand. As said before, the main distinguishing feature of Mitla is the intricate mosaic fretwork and geometric designs that adorn the walls. The geometric patterns called grecas in Spanish are made from thousands of cut, polished stones that are fitted together without mortar. The pieces were set against a stucco background painted red. The stones are held in place by the weight of the stones that surround them. Interestingly earthquakes have caused more problems with some of the massive lentils than with the walls of interlocking stones. There is a system of numerology to the designs. For me it is these designs and their construction that hold the interest. When you get to Teotitlan you will see the designs repeated as rug patterns. For more pictures of Mitla click here or explore the web.